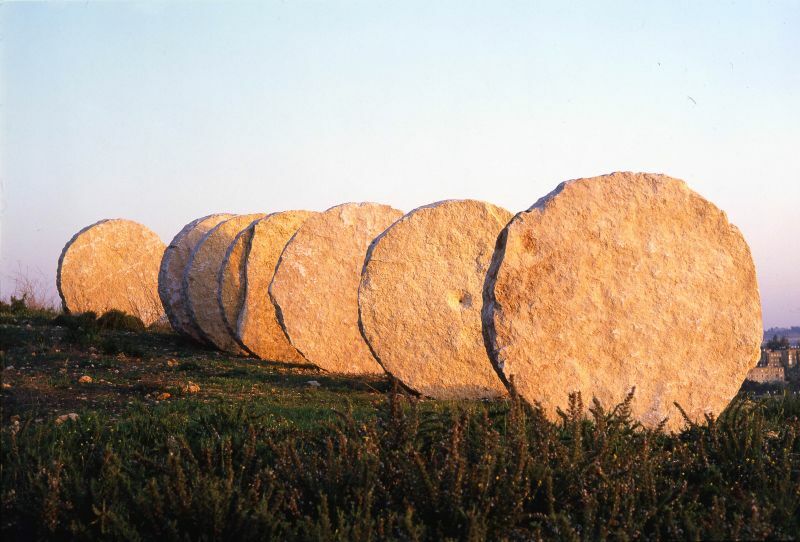 On her very first day in Jerusalem, in April 1987, Abakanowicz, deeply impressed by the powerful impact of the local limestone, decided to work in stone for the first time in her career. For an artist who had been known for soft, three-dimensional abstract shapes-"Abakans" woven from thick fabric and gradually enriched with coils of thick ropes and cords, followed by the monumental series of "Sitting Figures" and "Backs," hollow, headless figures made from sackcloth, burlap, and fiber - this decision was quite radical. The search for a suitable stone brought her to the Mitzpeh Ramon quarry, deep in the Negev Desert, where her new and perhaps most abstract work, named after the site of the quarry, was hewn from layers of limestone. Negev consists of seven monumental ten-ton wheels, each 280 cm in diameter and 60 cm thick. Their irregular round shape was achieved with a hammer and various pointed metal instruments usually used by local stonemasons. At the center of some of the wheels the artist carved a navel-like indentation, according to the critic Barbara Rose, "expressing her sense of the place Jerusalem as the omphalos mundi, the navel of the world." The surface of the disks, enriched by fossils, was left untouched. Being located in Jerusalem, Negev evokes associations with local olive crushing, millstones, and the prehistoric shores of the Mediterranean, where the wheel was in use very early on. The seven-wheeled sculpture also alludes symbolically to the seven ancient gates of Jerusalem, to the seven days of Creation, to the cult of the sun, to oneness and perfection, and even, in a slightly more remote context, to the monumental and enigmatic stone circle of Stonehenge.